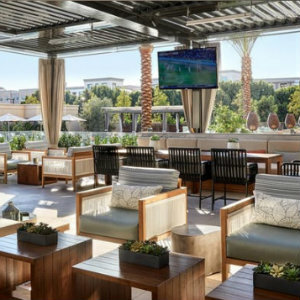 Huddle up and enjoy Big Game Sunday at Marriott Irvine Spectrum on Sunday, February 3 kicking off at 3 p.m. Grab some friends and grub on special Food & Beverage offerings (think: wings & sliders) in the hotel's Private Dining Room, M-Club Patio or Media Lounge. Price: $1,200 + fees and tax. Up to (15) guests will enjoy a beer well (50 beers w/ options to sub wine or champagne) and Big Game Buffet in the Private Dining Room. Price: $2,500 + fees and tax. Up to (30) guests will enjoy a beer well (50 beers w/ options to sub wine or champagne) and Big Game Buffet + Private Bar on the M-Club Patio. Up to (30) guests will enjoy a beer well (50 beers w/ options to sub wine or champagne) and Big Game Buffet + Private Bar in the Media Lounge. 7905 Irvine Center Drive in Irvine.